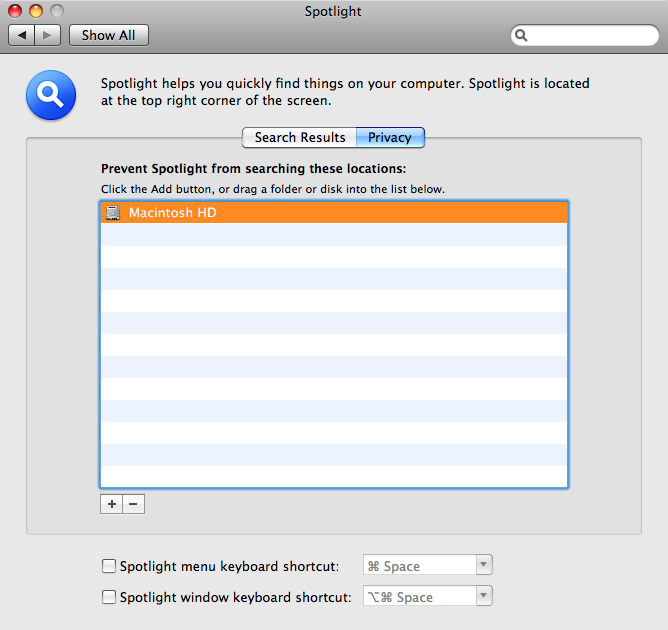 I personally never use Spotlight, but its indexing process mds still runs on my box. (It's possible that I turned it off completely using a different hack before I upgraded to Leopard, and the Leopard upgrade restored it.) Occasionally mds will use a lot of CPU. Here's a simple way to fix that. Now Spotlight will not index anything. The process still runs, but obviously it doesn't have any reason to take up a lot of CPU any more. Update: I have a couple new machines. One's an older MacBook I bought cheap off Craig's List as a backup box in case anything else breaks. I think it's still got some files in there from Tiger, although I could be wrong. So when mds was churning away despite my chmoding the binary into oblivion, I also did this and this.